South Korean owned Hynix, said production should resume shortly after an explosive fire broke out at their China based memory chip plant in Wuxi. The fire started at around 3.50pm local time yesterday during chip equipment installation and was extinguished in under two hours. Luckily no one was seriously injured in the fire, Hynix stated that there was only one minor injury and the fire was not as severe as it might seem. 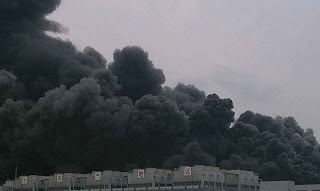 Photos taken at the scene by local media show thick, black smoke billowing from the plant, but Hynix assure that because the fire was concentrated in the air purification facilities, that are linked to the rooftop of the fab, the smoke seemed much worse than it actually was. Hynix are the worlds number two maker of DRAM chips and fears that the fire could increase prices yet again (please read our blog post Dram Prices Set to Rise in 2013) are at the forefront of everyone’s minds. Their Wuxi plant produces around 40-50% of their total DRAM output, so suspension of this plant could lead to a shortage in an already tight market. Hynix has stated that there is currently no material damage to the equipment and therefore they expect to resume operation soon, so overall production and supply volume will not be affected. We will bring you news on this issue as it happens. Have you thought of scheduling parts to avoid lead times? At Atlantis we offer a free Scheduling Service which will give you complete peace of mind when shortages or long lead times occur as your order can be scheduled up to 12 months in advance, this also helps keep the cost down too. For more information on our Scheduling Service, please visit our website.